In most personal injury cases, the first question is to determine whether the other party is responsible for your injury. Once it has been determined that they are at-fault and responsible for your losses, you then need to prove how much compensation you believe you are owed. Originally, courts applied a contributory negligence standard that would bar a victim from recovering any compensation if the victim’s negligence contributed to the accident. Because this rule was so harsh in many cases, most states have adopted a modified version of this rule that reduces the amount of compensation according to the victim’s negligence. Georgia has adopted what is referred to as a “modified comparative fault” standard. The rule works by reducing your compensation by calculating the percentage that your negligence contributed to the accident up to 50 percent. If your negligence contributed to more than 50 percent of the accident, you do not recover anything. For example, let’s say that you fell down a broken staircase and were injured. After medical bills, lost wages, and other expenses, your claim is worth $5,000.00. However, when you fell, you were texting on your phone and therefore not paying attention. If it’s determined that your negligence contributed ten percent to the accident, your compensation would be reduced by ten percent or $500.00. If you ignored signs that said the staircase was closed, you may not be able to recover anything if your negligence contributed more than 50 percent. The hazard was obvious and easily avoided. You were not paying full attention to your surroundings. You were on a part of the property closed to guests and visitors or otherwise prohibited. You were wearing inappropriate clothing or footwear that contributed to the fall. Again, if the property owner can prove that your negligence contributed more than 50 percent to the accident, you may be prohibited from receiving any compensation. 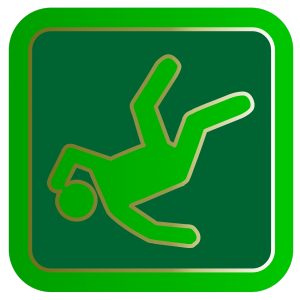 If you’ve been injured in a fall on someone else’s property, the experienced slip and fall attorneys at Slappey & Sadd can help you get the compensation you deserve. We can assess the value of your claim, and challenge any argument that suggests you were at fault. Don’t leave your recovery in someone else’s hands – call us at 888-474-9616 or contact us online for a free consultation.